The wolf is a carnivore, an animal suited for catching, killing and eating other creatures. Wolves prey primarily on large, hoofed mammals called ungulates. 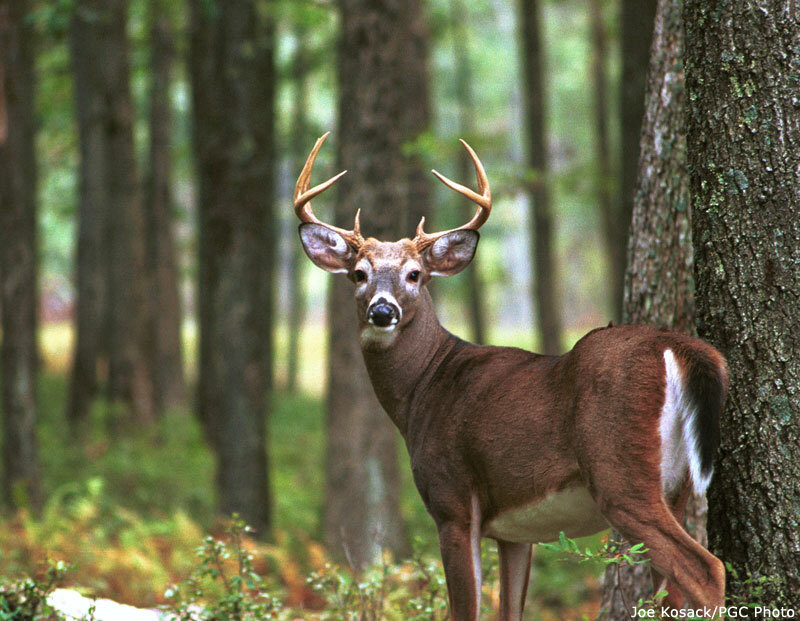 In Minnesota, the white-tailed deer is the wolf’s primary prey, with moose, beaver, snowshoe hare and other small mammals also being taken. 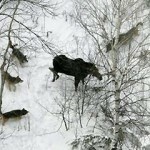 Elsewhere, wolves prey on caribou, musk-oxen, bison, Dall sheep, elk, and mountain goats. All of these ungulates have adaptations for defense against wolves, including a great sense of smell, good hearing, agility, speed, and sharp hooves. As these prey are so well adapted to protecting themselves, wolves feed upon vulnerable individuals, such as weak, sick, old, or young animals, or healthy animals hindered by deep snow. By killing the inferior animals, wolves help increase the health of their prey population a tiny bit at a time. When inferior animals are removed, the prey population is kept at a lower level and there is more food for the healthy animals to eat. Such “culling” also ensures that the animals which reproduce most often are healthy and well suited for their environment. Over many generations, this selection helps the prey become better adapted for survival. 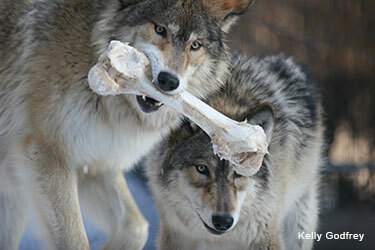 Wolves require at least 3.7 pounds of meat per day for minimum maintenance. Reproducing and growing wolves may need 2-3 times this much. 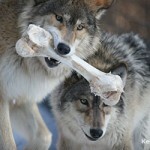 It has been estimated that wolves consume around 10 pounds of meat per day, on average. However, wolves don’t actually eat everyday. Instead, they live a feast or famine lifestyle; they may go several days without a meal and then gorge on over 20 pounds of meat when a kill is made. In Minnesota, each wolf eats an average of 15-20 adult-sized deer or their equivalent per year to meet their nutritional requirements. Based on this average, and the estimate of 2,400 wolves in Minnesota, wolves kill the equivalent of about 36,000 to 48,000 adult-sized deer per year. In comparison, Minnesota hunters take around 52,500 deer per year in wolf range (over 250,000 for the entire state) and several thousand are killed during collisions with vehicles. Wolf predation on ungulates varies seasonally. It is highest during mid to late winter, when animals are suffering from poor nutrition and the snow is deep, making them easier to kill. It is also quite high in early summer when prey animals have their young, as wolves prey heavily on vulnerable young. The question of whether wolf predation is additive (the number of animals killed are in addition to those which would die otherwise) or compensatory (animals wolves kill would die anyway) is a complicated one, as wolf predation effects vary with the prey species, time of year, area, and system. It is quite probable that wolf predation is both additive and compensatory, and the real question is how much of it is additive. For example, wolf predation on deer is moderated by the severity of the winters. In a severe winter, wolves may kill healthy deer which would have survived the winter had they not had been made vulnerable by the deep snow. This would be an example of wolf predation as an additive factor. Conversely, in a mild winter, when the snow levels are low, healthy deer easily escape wolves. 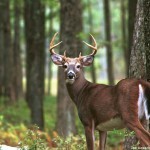 Therefore, the deer captured are primarily sick or weak. This would be an example of compensatory mortality, as most of these deer probably would not have survived the winter. This is why it is rare to find a starving deer in Minnesota wolf range. Reciprocally, prey populations may limit wolf numbers. 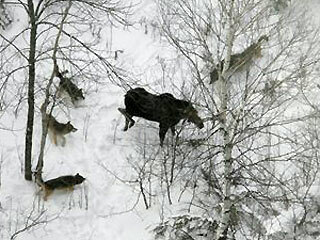 When considering the examples above, the potential for prey numbers or conditions to regulate wolf numbers is observable. In a mild winter, deer will be healthier and wolves may not be able to catch enough animals to feed themselves. This may cause a decrease in the wolf population. It is also possible that several severe winters in a row would decrease deer populations and wolves may not be able to kill enough food to eat, so again wolf numbers would decrease. Another factor complicating our ability to determine the precise effect of wolf predation, is that it is difficult to tease out the effects wolves have on their prey populations in areas where there are many different predators. For example, in Yellowstone National Park, in addition to wolves, there are grizzly bears, coyotes, mountain lions, bobcats, lynx, wolverines, and black bears which all prey on Yellowstone ungulates. In summary, we cannot generalize about what kind of effect wolves have on their prey populations, because their effect is dependent on so many factors. It is possible to get an indication of wolf and prey population trends in a small area or system, but generalizing from one to the other is not always valid.